The City of Takoma Park requires that all multifamily and commercial properties provide tenants an opportunity to recycle. Takoma Park Code Chapter 10.12 and 10.14 was amended in July, 2015 to mandate recycling in businesses and apartments. NOTE: This page is for business and multifamily recycling information. For information on residential curbside recycling visit the Recycling Collection page. Curbside collection services are provided for single family homes and multifamily apartments with less than 13 units through the City. 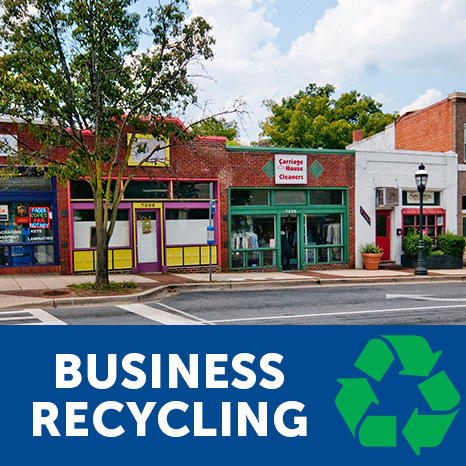 Visit the Business Recycling Information and Multifamily Recycling Information pages for resources including vendor lists, annual recycling reporting requirements and printable notices. The primary focus of the implementation of the law will be toward compliance through education and public outreach. Multifamily and commercial properties found in violation can be issued a notice of violation. Failure to correct a violation will result in a Class C municipal infraction, which carries a $200 fine and may be levied on a per-day/per-unit basis. No business shall place any refuse or recyclables generated from the business in street containers provided by the City for public use. Doing so may result in a $400 fine. Multifamily units with private collection are required to file an Annual Recycling Report with the City of Takoma Park. More details are available on the Multifamily Recycling page. Links to forms are also available in the table below. Looking for information specific to business or multifamily recycling in Takoma Park? Visit the Business Recycling or Multifamily Recycling pages for detailed information on what recycling requirements are for your city. Businesses in Takoma Park are required to recycle. Visit the Business Recycling page for more information. 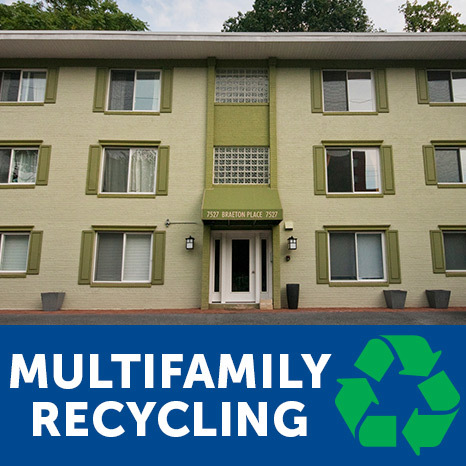 Multifamily buildings in Takoma Park are required to recycle. Visit the Multifamily Recycling page for more information. Links to resources including required multifamily annual reports and notices are available in the table below. Businesses and multifamily residences that receive collection service from the City of Takoma Park are required to recycle the following items below. Businesses and multifamily properties that receive collection from a private hauler must follow the instructions provided by their hauler. metal aluminum foil Must be free of food.